In a closely contested and controversial game throughout, Mexico were able to kick off their World Cup campaign with a bang as they defeated Cameroon 1-0, thanks to a second half goal from Oribe Peralta in Natal. In the second World Cup game of 2014, Mexico saw off Cameroon with Oribe Peralta struck home after Giovani Dos Santos's shot was parried by goalkeeper Itadje. Overall, many people thought this was a very controversial game, as not one, but two of Giovani Dos Santos' goals were disallowed due to the offside flag. When the replay showed, it looked like the linesman may have got it wrong, leaving Dos Santos and Mexico hard done by. Football fans packed the beautiful Stadium in Natal, awaiting the second game of the greatest football spectacle in the world. After the wait, Mexico and Cameroon finally got it on, and the first 15 minutes of the game was very even, as both sides were trying hard to get the opening goal. Just around the 20 minute mark, Cameroon came really close to taking the lead, as Samuel Eto'o's header hit the post, and went out. The only real chance or opportunity for Cameroon to shout about. After the Eto'o missed chance, Mexico were next to pose a threat as they THOUGHT they broke the deadlock with a beautifully timed strike by Dos Santos, disallowed due to the offside rule. 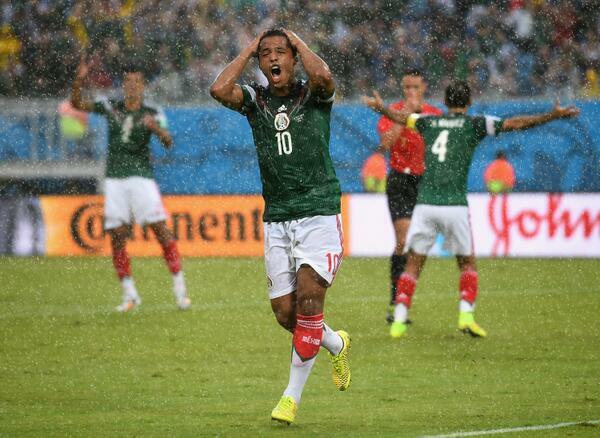 Not too long after the disallowed goal, Mexico put pressure on Cameroon and won a corner. A great corner that Dos Santos got on the end of again, was also disallowed. This angered and frustrated the Mexicans and their coach, and understandably so, because when the replay was shown, the ball actually deflected off the head of a Cameroon defender, proving that Dos Santos was onside and the goal should have counted. Cameroon were looking good on their set pieces and corners., as they put Mexico under a little bit of pressure, but no Cameroon player was able to shield the ball into the goal. With not many chances or goals in the first half, the fans in attendance hoped for a better second period. Mid way through into the second half, the deadlock was finally broken, and it was broken by the side that was the more threatening throughout, Mexico. After Giovani Dos Santos' shot was parried by Cameroon goalkeeper Itadje, the ball fell to Oribe Peralta and the Mexican struck home to ensure his team got the well deserved goal, and edge them closer to a victory. The second half wasn't that better than the first, but as the match went into stoppage time, Cameroon had a marvelous chance, as Moukandjo's powerful header was firmly saved by Ochoa, keeping the Mexicans in front, and leading them to victory against Cameroon. Stalemate first half: Flat first half, Mexico coming closest to breaking the deadlock. Dos Santos misery: Giovani Dos Santos's disallowed goals misery was secured by late Peralta strike. The win for Mexico may give them a chance of beating the Group Stages, but it's sadness for Cameroon as they lose out on points. After the controversy, Mexico still get the job done thanks to Oribe Parelta's 61st minute strike. Oribe Peralta wins the game for Mexico against Cameroon, but its controversial nonetheless.